With the weather cooling down, it's nice to warm your innards with some delicious fall soup. Heat the bacon grease over medium-high heat. Add the celery and onions and cook til they start to wilt. Add the ham hock. Add the cabbage, garlic, bay leaves, black pepper, salt, and cayenne. 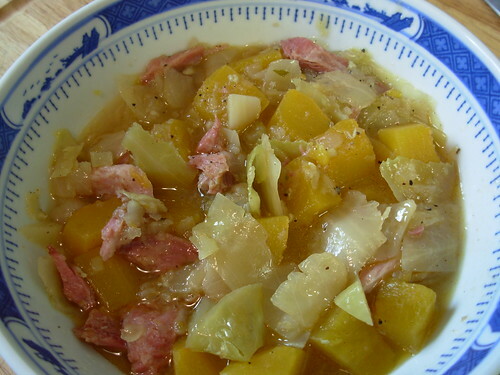 Stir and cook until cabbage is slightly wilted, 3-4 minutes. Pour the broth in, bring to a boil, and simmer uncovered for 30 minutes. Add the pumpkin, cover, and simmer 1 hour. Remove the ham hock from the pot and remove the meat from the bone. Shred the meat and stir it back into the soup. Remove and discard the bay leaves. This makes great leftovers and I think the taste even improves with age. Goes well with a side salad for dinner. I say these are only mostly paleo because they do use baking powder/soda and flavoring extracts, which I doubt our cavemen buddies had access to. They are very tasty however, and and make a nice breakfast alternative to eggs or leftovers. I don't make them all the time, because let's face it, a muffin is a muffin! So eat these with care. I was procrastinating on writing this post because I have not felt the urge to eat pans of muffins myself, but I decided to just go ahead and write it anyway and try to find some old pictures to show you. Note: I use maple syrup or raw honey as my sweeteners of choice. I do not use agave nectar because it can be up to 90% fructose; fructose is processed in the liver instead of the bloodstream and has many deleterious effects. Mix together all the ingredients except for the cranberries until smooth. Fold in the cranberries. Spoon batter into 6 greased muffin cups (I use coconut oil) and bake for 20-25 minutes. These are very soft and cakey muffins. I think that cutting them in half and toasting them is very nice since it gives it little crisp edges. 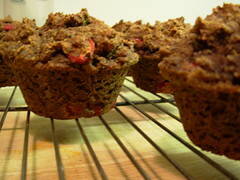 Banana nut muffins - use pureed bananas in place of the pumpkin, chopped walnuts in place of cranberries, and omit the pie spice. Recipe adapted from Eating Stella Style by George Stella. Pour into 6 muffin cups greased with coconut oil and bake for 15-20 minutes. I don't have a picture for these. This is an experimental recipe. 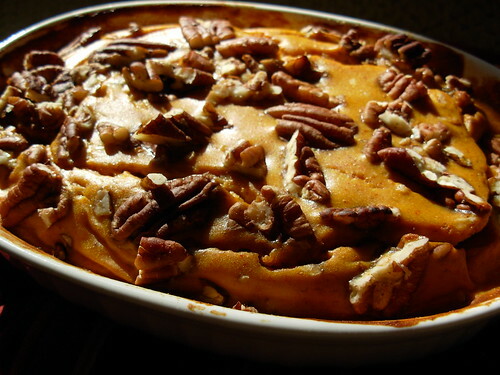 The original recipe is from a low-carb book and uses butter and Splenda. I am 99% certain that you can subsitute paleo ingredients and end up with a tasty product, but I have only tried the original version and haven't made the paleo version yet. If anyone wants to try making these, let us know how they turn out! Whisk together almond flour, stevia, baking powder, and salt in a medium bowl. Meanwhile, melt the coconut oil. In a food processor, process maple syrup or honey with the lemon zest until combined. Add lemon juice, eggs, and vanilla. Process until combined. With the food processor running, add the melted coconut oil in a steady stream. This should take at least 20 seconds. Transfer mixture to a large bowl and gradually stir almond flour mixture into the wet mixture. 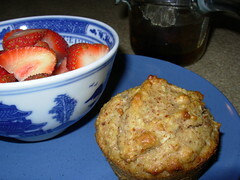 Grease 12 muffin cups with coconut oil and distribute batter equally among the cups. Bake 10 minutes. Reduce oven temperature to 325 and continue baking til done, keeping an eye on it, about 20-25 minutes. The time can vary a lot so be sure to keep an eye on it and don't let it burn. Recipe adapted from 500 More Low-Carb Recipes by Dana Carpender.